concrete driveway contractor that will address every specific issue and question you have about your Bloomingdale home or commercial project. We offer the workmanship you want and the respect you deserve with every concrete job. Bloomingdale, Illinois is one of the earliest settled villages in DuPage County just northwest of Metro Chicago. Bloomingdale has nearly 22,000 residents and is home to the popular Stratford Square Mall which is the city’s largest shopping center. Everlast Blacktop is proud of being able to create relationships as a concrete contractor. We not only create spectacular concrete driveways and stamped concrete driveways but remarkable service and communication. Everlast Blacktop is more than a concrete driveway contractor we are a full-service concrete contractor for all your concrete projects. Everlast Blacktop is a concrete contractor that delivers on our word for a timely start and finish to your concrete project. You will receive an accurate and reasonable bid for your project. We are known for exceeding expectations when it comes to our quality concrete driveways and stamped concrete driveways. Everlast Blacktop is ready to make you are next satisfied customer. 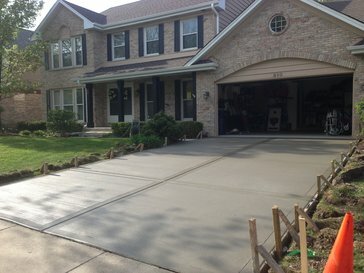 So, call the leading concrete driveway contractor today at (630) 855-5572 to get your quote. We are prepared to help you with all your concrete needs!